Last night I hosted my first-ever cookie swap. 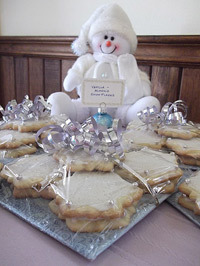 It was so much fun and the cookies were terrific. We enjoyed mulled wine and great company. However, I forgot to ask everyone to bring copies of their recipes to share. A few other friends have asked for my cookie recipe so I thought I’d just post it here for everyone. 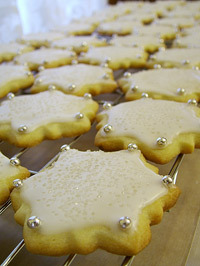 About ten years ago I purchased some snowflake cookie-cutters from a company named Gourmet du Village. The cutters came with a delicious recipe and a vanilla powder and turbinado sugar mixture. I’ve since lost the recipe but I still have the cookie cutters so I needed to come up with a new one. This recipe was adapted from an old cookbook in my collection. So now, every Christmas I can make pretty snowflake cookies that remind me of how much I love winter and the beauty of a snowflake. Cream the powdered sugar and butter together in a large bowl. Mix in the vanilla, almond extract and egg. Combine the dry ingredients and then mix them into the butter, sugar, and egg mixture until you have a soft dough. Wrap tightly in plastic wrap and refrigerate overnight. Preheat oven to 375°F. Lightly grease a cookie sheet with vegetable shortening or line with baker’s parchment. Very lightly dust your board with a little flour. Do the same with your rolling pin or use a pastry cloth on the rolling pin to prevent the dough from sticking. Roll half of the dough 1/4 inch thick. Dip your cookie cutter into flour or icing sugar and tap off any excess. Cut the rolled dough into shapes with your favorite cookie cutters. Move, using a thin spatula, to the greased cookie sheet leaving 1-inch between cookies. Bake for 6-7 minutes or until edges are just start to turn golden. Remove from cookie sheet to cool on a wire rack. When cool, ice with your favorite frosting and decorate as desired. Makes about 50-60 cookies depending on the size of your cutters. I used 2 1/2 inch snowflakes. Notes: To roll the dough evenly use 2 pieces of 1/4-inch dowel that are about 14-inches long. Place them beneath either end of your rolling pin. Roll the pin over the dowel with the dough in between the pieces. You’ll end up with perfectly even cookies. Try to limit rerolling the dough to 1 or 2 times as the cookies will become tough if you handle the dough too much. Use very little flour to keep the dough from sticking as adding too much dough will result in a tougher, drier end product. Mix the icing sugar, almond extract and milk together. Add additional milk by the single teaspoon until you have an icing that is thin enough to spread but thick enough that it doesn’t run off the cookies. For the snowflakes I iced the cookies once they had cooled completely. After icing a cookie I immediately sprinkled it with coarse sugar to add sparkle. Then I used a silver candy ball on each point to jazz them up. I found that decorating 1 or 2 at a time gave the best results. Be sure to let the icing set completely before you package the cookies. If you are layering them in a tin, separate each layer with waxed or parchment paper.